You installed the Recovery Console with ComboFix. Yes please stay in Normal Mode from now on. Here is my ESET log. I'm also happy to say that I'm now able to actually upload the file straight from my laptop rather than transferring everything back and forth with a thumb drive. I can't tell you happy that makes me! Thank you so much for all the help thus far. If there are no more malware issues we can finish up now. * Check the box next to Enable thorough system inspection. * Allow the scan to finish and scroll down to see if any updates are needed. If you are using or have installed IE6 you are using an outdated and soon to be unsupported version of Internet Explorer and I strongly suggest you update to the latest version directly from Microsoft Internet Explorer 8: Home page. I recommend you keep SUPERAntiSpyware and Malwarebytes Anti-Malware for scanning/removal of malware. Unless you purchase them, they provide no realtime protection so will not interfere with each other. They do not use any significant amount of resources (except a little disk space) until you run a scan. SpywareBlaster - Secure your Internet Explorer to make it harder for ActiveX programs to run on your computer. Also stop certain cookies from being added to your computer when running Mozilla based browsers like Firefox. Protect yourself against spyware using the Immunize feature in Spybot - Search & Destroy. Also see Slow Computer? It May Not Be Malware for free cleaning/maintenance tools to help keep your computer running smooth. Also, let's do some clean-up. 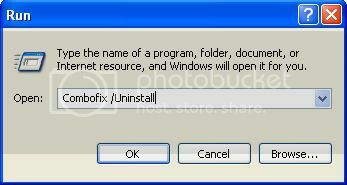 You can uninstall HJT and delete ESET. You can keep SAS and MBAM. Update them and run them every so often depending on your internet activity. Thank you so much for the help and recommendations for keeping myself safe in the future - I definitely appreciate it!